Suppose instead, though, the meme had said, “your story of a dying and rising God would be gone forever.” That would be arguing against our strong point. They didn’t do that for some reason — maybe because there’s lots of evidence in history for Jesus’ resurrection. He really did rise from the grave. It happened in real history, and it’s good news for us who still live in real history. This meme’s what-if about human knowledge dying off and starting over isn’t real history. But suppose it were to become that way. The worlds’ real history would still be real. That real history would still include the same story of humanity’s creation, fall and ultimate redemption. Above all it would still include God, who has already told us His own story in His word, and would have every opportunity to tell it again. What this meme supposes, obviously, is that none of that is true. Therefore if all humanity had to start over again, it would have to do it without God. Which is simply to say that the meme’s writer doesn’t believe in God today. So if this an argument against God, it’s a lousy one. It begins with the hidden assumption, “I don’t believe in God, so this is what I think would happen if …” Arguments of that form are nothing but personal opinion, wrapped up in fancy impressive clothes. Why Would Science Start Again, Anyway? But there’s a further twist that makes this even more interesting. What does it take for science to start? What did it take for it to get rolling the first time? Consider how much effort and dedication science requires. Research is costly, both in time and money. The world spent an estimated $1 trillion on science in 2010 alone. Plenty of experiments succeed by showing the scientist she was on the wrong track, so she has to back up and start over again. Why would anyone even do science? Today the answer is easy: Because we know it works. What about at the beginning of science, though, before anyone knew how much it could do? Most of the world, throughout most of human history, had little reason to expect science to work. They hadn’t seen it work. Their religions and philosophies didn’t expect nature to be rational. The gods played with nature, they thought, and they played with human lives and minds as well. There was no point in putting time or energy in trying to understand them. There wasn’t even any point in trying to improve humanity’s lot, since most people of the earth expected nothing would ever change. What had been would always be. Still science got started, in spite of the costs and in spite of the risks. Where? In Christian Europe, and only in Christian Europe. Early scientists owed something to Greek and Islamic thinkers, but those Greeks and Muslims didn’t produce much science themselves. What it finally took (many thinkers argue) was a view of reality in which God cared about His creation, not only to make it but to walk right into it, in the person of our Lord Jesus Christ. Therefore Christians, too, can have regard for the natural world God created. It also took a view of God wise and rational, a view which led early scientists to expect His creation to mirror His rational ways. Indeed, science in its early days was almost entirely the product not just of Christians, but of Christian clergy! And Christians have played central roles in science ever since. Would science start up all over again? Not unless people knew it was worth pursuing — which real history shows us depended a lot on Christianity. Part of a series on atheist memes. Modern academia increasingly rejects the logic of science whilst trying to retain the mantle of it. If gender, morality, and all the various absolutes which the Left now question or outright reject are seen as the new scientific approach then what grounds are there to assume that chemistry and biology could be reinvented? Objective facts are increasingly at odds with what is preached by those who subscribe to scientism. That being the case if all technology, texts, and knowledge were lost it is just as likely that the scientists in that future would teach the world is flat, a belief in 101 sexes, or other such absurdities as truth and claims to the contrary, especially if supported by objective facts, denounced as evil. By contrast ignorance about God only works in a closed system. If outside intervention is possible, which is what Christianity teaches, then the loss of all knowledge of God would not result in the account of a talking snake being lost forever. Your statement is both erudite and “right on the money.” Excellent! The story of the “talking snake” contains a prophecy (Genesis 3:15 [b]), that was fulfilled . . . thousand years later with the life, death and resurrection of Christ. I.e. God’s promise of a path of salvation came immediately after the fall. Don’t know why atheists have a problem with a talking snake given that a guy can put a skirt on and tell us he is now a girl. Just look at what Bruce Jenner did and he got woman of the year award in 2015. Science existed long before Christianity. Peoples before Christianity developed mathematics, astronomy and medicine. Knowledge from science made it possible for the Egyptians to build the pyramids, to make tools and weapons made of bronze and iron, to calculate the circumference of the Earth, and many other things. The fact that Christianity helped advance science doesn’t mean science depended on Christianity. It seems you do not understand Christianity or its origins in the slightest, which makes me wonder why you feel qualified to speak on the subject? Did science exist before Christianity? No. Only technology. See above. Quite true. The Romans were terrific engineers and built wondrously during their time of power but achieved very little in the way of science as we know it today. No one disputes that, T. But there is a significant difference between experimental science and applied science. It is the former that is mostly under discussion here. What we understand as the modern scientific method absolutely did not exist prior to Christianity, that is simply a demonstrable fact of history. In reference to Mr. Gilson’s comment, do you understand the difference between the scientific method and technology? The scientific method produces scientific knowledge. Technology is the application of that scientific knowledge. If there was technology to build pyramids before Christianity then there had to be science to produce that technology. The modern scientific method can and does produce technology but technology can exist and did exist prior to the establishment of the modern scientific method. Technology can arise without the application of the modern scientific method simply by the process of trial and error. I am also curious why you insist on pushing the idea the belief in the saviour of mankind is something which is of rather recent historical occurrence? Can you explain that, please? The scientific method is a process of trial and error. The Christian idea of a savior of the world is 2000 years old. Other religions have their ideas of God as savior. Judaism has its own idea of God as savior. That’s rather oversimplified, T. The scientific method is based on the testing of hypotheses formed from empirical observation (or occasionally rational deduction from theory) in an environment specifically designed to anticipate and minimize variables or potential bias. Imperfect, but rather effective. A trial-and-error approach is much less structured and a great deal more haphazard. The scientific method as it is defined and practiced today is only about 60 years old. How was science done before that? Was there no method to it? Oh, ha, ha, ha! Tell that to Francis Bacon (1561-1626), widely credited as *the* influence behind the development of the modern scientific method, which was put into practice by just about every major figure of the scientific revolution that got its start in the 17th century. Your facts are off by about three centuries. The scientific method as it is defined and practiced today requires scientific theories and hypotheses to be falsifiable. That requirement was added to the scientific method less than sixty years ago. Did Francis Bacon use falsifiability? Scientific research has always had a method to it that has evolved over thousands of years. Just because scientific method was given a name at a certain point in time doesn’t mean it didn’t exist before that. Did Christianity exist before it was called Christianity? True Christianity today is very different from the Christianity of the first century. Does that mean Christianity wasn’t practiced in the first century? Uh, no, it is not. The scientific method is a process of carefully contrived amd closely controlled experiments based on hypotheses borne out of observations. Perhaps you had better do some homework on the subject. Seriously, your understanding of the theology of Christianity is that misinformed? Truly sad. Perhaps you need to do some homework in that subject as well. Certainly before you make any more comments on the subject. The scientific method as it is defined and practiced today is only about 60 years old. But I view the scientific method as something that has evolved and developed over thousands of years. The term “scientific method” is relatively recent and Christianity cannot take credit for it. You’re entitled to your view but don’t expect everyone to agree with it just because you say so. The sciences can only make sense if you know everything in creation is not Divine (something you explicitly reject as only Chtistians can understand why that is) and that all is intelligible (only possible if all has the same uncreated, uncontingent Prime Mover). How did the Egyptians build the pyramids without science? The sciences were created in 600AD by the Church. How did the Egyptians build the pyramids using slave labor without science? By killing anyone who did not make perfectly level work. science is studying the natural world through observation, you are stretching that word pretty thin by claiming engineering is a science. I never claimed engineering is science. yet you are co-opting engineering to claim science is older than it is. No, just applied science, as in your response to one of my posts below. And that is correct. But in our discussion of the natural sciences, the applied sciences are excluded. They do not depend directly on the scientific method to reach their conclusions. Applied science does not use the scientific method. Applied science is when people such as engineers take knowledge from science and apply it to the design of things. For example, the ancient science of metallurgy came up with steel. Engineers used steel to design and make chariots. The chariot was technology that could be used in war. So, if ancient people had engineering and technology then they had to have had science. True science as we understand it today — seeking regular law-like explanations for why nature does what it does — did not pre-exist Christianity. Some technology did, but that’s not the same as science. By definition, technology is applied science. If there was technology before Christianity then there had to be science to produce it. Modern scientific theories and hypotheses must be falsifiable. That requirement came from Karl Popper, a secular humanist. Yet there has been no substantial advancement in science since it tried to remove itself from its foundation. The “advances” in pushing your gnostic religion under the guise of “science” doesn’t count. Men walking on the Moon and exploration of Mars seem pretty substantial to me. To what end? No, really. Seems to only serve as a way for the government to make its friends in aerospace rich. What was the last substantial advancement in science? Going by how old the equations I used in university are: a long time. What about this equation: the square of the hypotenuse is equal to the sum of the squares of the other two sides? Did the Church come up with that one? you mean pythagoras’ theorem? The guy who was ran out of cities and hunted for execution because his proto-gnosticism was too evil for even the pederast devil worshippers of athens? Did the Church invent the theorem or did Pythagoras hundreds of years before the Church? Did the Church invent Euclidean geometry or did Euclid hundreds of years before the Church? pythagoras believed that they would ascend beyond humanity if they did enough mathematics, and then figured they would speak exclusively through music. That on top of the human and animal blood sacrifice. So now you are co-opting a mathematic equations for the sciences? There was math and engineering before the Church, but that is not science and the Church improved those fields as well. There was Aristotelian Physics, but nothing on the level of substance that the Church provided. What was the last substantial advancement in science the Church provided? All of them, the sciences can only be properly founded within the Church. Why do atheists exult in being clones? Replication is not the mark of genius. While the Pythagorean theorem may be rediscovered, every piece of art from cave paintings to Shakespeare to Miles Davis would be gone forever. Other people would create other art, but all of the art that came before would never be “replicated”. It’s a things uniqueness that gives it special value. Not the ability to perfectly copy it. All the ‘meme’ proves is that scientists are always replaceable. Artists, on the other hand, are unique. God is like all really great artists. There will always be people that just don’t get it. It’s amusing to me that they’d assume people would continue to ask “how?” but would instantaneously stop asking “why?”. The question “how” is nigh-insignificant compared to “why”, but science, in its materialistic form, comprehends no purpose, no “why”. It is inevitable that humanity will therefore develop answers to “why”—likely reinventing the natural theology of the Philosophers and Aquinas, though our revealed knowledge of God would be lost—before they ever dare to begin asking “how?” and following the course of science. One thing that the Bible affirms and demonstrates is that it is God, Himself, who reveals Himself and his will to man. Our shortcomings do not limit His abilities! This meme contains it’s own refutation. If they rediscovered it, that would mean that so much of it pre-existed them as a mind independent, objective reality which atheistic materialism still cannot account for. If atheists believe in evolution, why can’t they evolve? There’s a more elementary problem facing the atheist here. If humans created science, as the atheist believes, they also created religion. It is immaterial for this argument whether the religion is true or false. The fact is that the atheist can only explain religion as a human creation just like science. 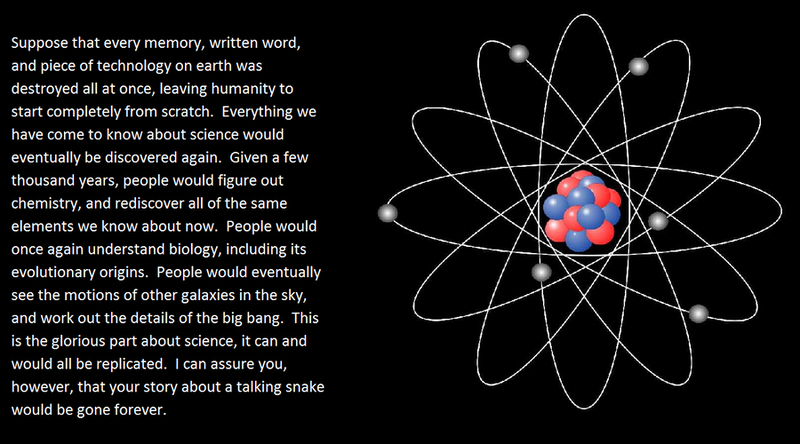 Therefore if science can come back, starting from a blank slate, so can religion. The atheist must agree with this. The talking snake will definitely be back, whether the atheist wants it or not! Sure, religion would come back, but Christianity would not. All religions including Christianity were created by humans and reflect the efforts of humans to understand God or to manipulate God or to manipulate people. It’s extremely unlikely that humans would create the exact same religion twice. You pronounce that with all the authority of someone who thinks we ought to believe it because you’ve pronounced it. Haven’t you noticed? Not everyone here thinks that’s persuasive. Everyone speaks their opinion as if it’s established fact. If you don’t speak boldly, nobody will pay attention to you. That’s why atheists are always shouting. So you have traded eternity for attention on the internet? Let’s not be too hasty – I think it’s persuasive. If you want evidence, just look at the number of different religions that have been invented. So because your reprobate mind has lost the ability to parse between Truth and error, everything is error? Do you believe some religions were created by humans? Say the LDS religion or Islam or Hinduism or Buddhism? Or are they all dictated by the master and creator of the universe, just like your religion? If only your religion is the true one, how can you tell the difference? Christianity is only a name, it is not a religion. What we label as Christianity was formed by God at the outset of creation. The belief in and the worship of God make Christianity a religion. Perhaps to you, but to me Christianity is not merely a religion, it is an entire way of living and viewing the world. If you wish to limit it to just another religion you’re welcome to do so. That looks suspicious, right there. What, that the apostle should defend his witness against scurrilous accusers? Should truth sit down when lies do jumping jacks? When someone says “we didn’t make this up”, it means they made it up. Horse hockey. You’re desperate now. Not shooting the messenger–I’m refusing delivery by the manure-shoveler. Peter did not worship a triune god or believe in eternal conscious torment in a fiery hell. These are aspects of the Christian religion that were created by humans. You should also examine 2 Peter 1:16-21 carefully. Nothing in any of those verses indicates that God is triune. Notice it says, “But in your hearts set apart Christ as Lord.” It doesn’t say to set apart Christ as God. It says, “Grace and peace be yours in abundance through the knowledge of God and of Jesus our Lord.” Notice it lists knowledge of God separate from knowledge of Jesus indicating that Jesus is not God. It also says Jesus our Lord and not Jesus our God. Done any reading on the significance of the title “Lord” applied to Jesus? That would explode your objection. Look, T, the Bible clearly declares the deity of God the Father, the deity of Jesus Christ, and the deity of the Holy Spirit. The cited verse from 1 Peter were my attempt to show you–contrary to your assertion–that Peter did not believe in a triune God. The Father is God, the Son is God, the Spirit is God. And yet the Father is not the Son, the Son is not the Spirit, and the Spirit is not the Father. They are distinct (not separate) divine Persons One God, three Persons. That’s the Trinity. And Peter affirmed all the elements, so he affirmed the Trinity. Yet the Church created the sciences and only the Church provides the foundation of the sciences to exist. Yet the Church rejects and condemns science it doesn’t like. If science found a definite biological basis for transgenderism, would the Church reject and condemn it? If science found a definite basis for transgenderism, then there would be a definite biological basis for a disordered condition. Science has already shown it’s disordered; politics has swept that under the rug. Moral order isn’t a scientific category anyway. you mean it rejects and condemns faulty science that has no basis in anything but trying to excuse gnostic religious dogma. your gnosticism is based on the delusion that reality changes to whatever you want. There are already many such “theories” and all of them more absurd than the last. Wwe already have Absolute Truth AND common sense. The Church knows of the cult of baphomet and can see what you are trying to revive under a different name. The atheist lives in a dream world in which he imagines himself to be a perfectly rational person whose every thought is based on empirical evidence. This is garbage. Your second sentence accurately describes you first sentence. Science is universal, religion is not. How do you explain that there is no English science or Arab Science or Oriental Science, there is just science. Because reality works the same way throughout the world and in the broader universe. There is no universal religion. Christianity is a minority religion on the planet. Would all the other religions come back too? Which one would be dominant? A survey showed that more than half of atheists believe in extra-terrestrials, so their claim to be “scientific” is shot. I think the talking snake is not our weakest position as Christians. Quite the reverse. The talking snake is strong. A person who cannot accept a talking snake lacks imagination. A person who laughs at the threat posed by the words the snake speaks has not understood their import. And as we know, the talking snake is still with us. The talking snake is in fact speaking today to atheists and others who defy God, and they are listening. Do not underestimate the talking snake. As Christians we should not consider the talking snake to be our weak point. The talking snake is there in the Bible. The snake is one of our strong points. Interesting points. I can see the wisdom of looking at it that way. One man’s imagination is another man’s gullibility. But my issue with the talking snake is: why is it there? Why did an omnipotent and omnibenevolent God allow such a thing in his garden knowing it would result in the Fall of Man? The biblical view is that God created people in his own image. This includes giving people free will, and therefore the capacity to go off the rails. What we might think about how God ought to have acted if God is “omniscient” and “omnipotent” (whatever that means) is irrelevant really, both ethically and factually, to what the Bible has to say. The message of the Bible is that God made us, and God lays down the rules, but we are inclined to listen to the snake. Beware of the talking snake! The Bible is giving us a picture that contains an important message. This is not an abstract philosophy. This is life, hands-on! you are a snake and you are talking. Also, do you mean the devil? The devil only has “power” in manipulating people. All you have to do is not listen and the devil serves no threat. Pity you didn’t realize that years ago. What do you think of the Harry Potter story? Talk about imagination! A talking snake pales in comparison. Why bother with a talking snake when you have magic, human drama and Hogwarts? 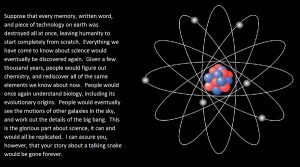 I agree with Alice Cooper; to paraphrase; if we believe in a God who is capable of creating the universe why would we be concerned with the idea of a talking snake? Perhaps Christians need to double-down on the “talking snake”. Do atheists, like Christians, talk to their dogs and cats? I strongly suspect so, and in anticipation of what exactly? Mere sentimentality? There is a glaring error in the stated meme, although understandable from the atheist’s naturalistic presuppositions. According to Christian teaching, God has revealed himself abundantly not just in a book or by the mouths of prophets but in his creation. God has not left himself without a testimony. The psalmist declares that the heavens themselves–from which the materialist hopes eventually to recover modern cosmology in the event of catastrophic loss–declare the glory of God. Man himself, fearfully and wonderfully made, declares the glory of his creator. According to Paul, there are things that men cannot not know, because God has himself written them on their hearts. If men examine the universe and fail to perceive God, they are without excuse, for they create their own blindness by their refusal to acknowledge what they see. If that’s the case, how come the people who dedicate their lives to studying the universe – scientists – are far less likely to be religious than non-scientists? 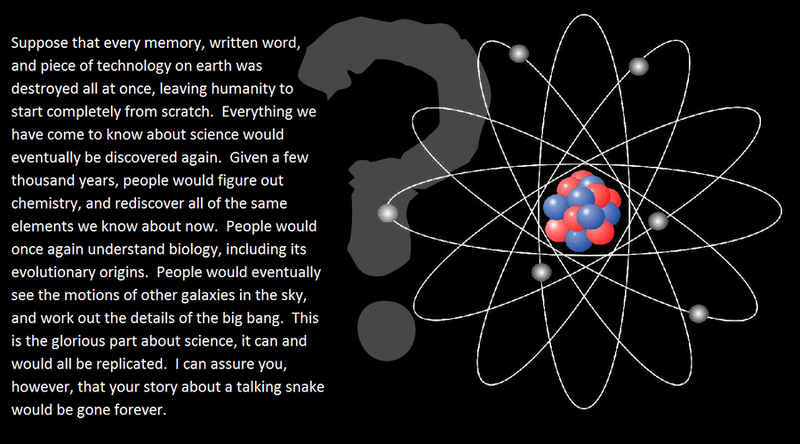 Could it be that the more we learn about the universe, the less need there is to invoke a god to explain any of it? “Could it be that the more we learn about the universe, the less need there is to invoke a god to explain any of it?” Unlikely, given the number of believers in the scientific community both currently and in the past. Rather, it is more a reflection of hearing without listening and looking without seeing. The noetic filters through which we perceive reality affect the conclusions we draw. In the past almost everyone was a believer, so let’s pretend you didn’t say that. Currently, scientists are far more likely to be atheists than are non-scientists. If something is fact, labelling it as ‘unlikely’ is shutting the stable door after the horse has bolted. “In the past almost everyone was a believer” is a statement of fact–I’m not sure why you think that can be dismissed. But some of those “everyone” were believers AND natural philosophers/scientists. Newton wrote more on biblical subjects than on natural philosophy. Faraday and Lord Kelvin were devoted Christians. Galileo and Kepler were as well. That just scratches the surface. Or perhaps you mean to charge these men as double-minded? I put it to you that if current scientists are far more likely to be atheists than non-scientists it is because of their presuppositions and unexamined biases, not science per se. You can’t make something of Newton being a Christian if, at the time he lived, almost everyone was a Christian. You previously made a claim about the (implied) high number of believers amongst scientists, which would, if true, be subject to the same argument. So these men were brilliant and original thinkers in everything other than matters of religion? Not buying it. Newton was fascinated by alchemy. Einstein thought quantum mechanics must be wrong. Being smart at one thing doesn’t mean you’re smart at everything. What does this creator god have to do with Christianity? A theistic creator is a necessary condition for Christianity, but no sufficient. The creation supports any variety of religion. “The creation supports any variety of religion” that affirms the existence of a theistic creator. Which is why general revelation only gets us so far. Christianity has two books–the book of nature and the Bible. God has revealed himself generally in creation, in times past by speaking through prophets at many times and in various ways, but in these latter days most comprehensively by and in his Son, the appointed heir of all things and the agent through whom the universe was created. The creation could support a supernatural creator, or it could be as science sees it, entirely natural. My point is that the creation does not support Christianity specifically, all other theistic and even deistic religions use the creation to support their non-Christian religion. So Christianity is left with one support, the Bible, which according to Christians was dictated by the master and creator of the universe. However, there have been many books whose followers claim were also dictated by this creator, such as the book for Mormon and the Quran. As a Christian, do you agree that these books are also divinely inspired? If not, why? And how can you tell the difference? 1. Christianity retains the support of general revelation; it has also the specific support of the Bible. 2. The Christian doctrine of inspiration is not a dictation theory, unlike that of Islam (in which Mohammed is said to have taken dictation from the archangel Gabriel to produce the Qur’an). 3. No, those other books are not divinely inspired, for they contradict the Bible in many respects and therefore could not all be from the same divine source. I like your argument in that the other books could not be divinely inspired because they contradict your divinely inspired book. Very convincing! Once you establish the standard or ruling norm, comparison to that norm provides you with means to determine compliance or variability. As the Bible can be established to be divinely inspired, any rival claimant that deviates from biblical teaching thereby disqualifies itself. I’m not sure who or what the “you” refer to as “the standard or ruling norm.” It makes sense if this refers to only Christians who agree with your interpretation. But it is certainly not the standard to the rest of humanity, especially those who believe in other books or religions. So you are back were you started. My book is true because I believe it to be true. That argument is about as strong as the one I hear from people of other religions. Do you have anything else? That’s what the establishing part is all about. How do you go about evaluating whether any particular authority is trustworthy? Is it merely a matter of accepting de fide, or are there criteria by which a purported authority may be evaluated? In the case of the Bible, we start with determining the veracity or trustworthiness of its content by the same means we evaluate any book and we establish that its reports concerning the life and ministry of Jesus of Nazareth are historically reliable. From there we determine by close analysis that Jesus was and is exactly who he said he was–the divine Son of God–which establishes his unassailable authority to speak on matters of his expertise. Then we examine his teaching about Scripture and find that he unequivocally declared the Scriptures to be the very word of God and are to be accepted as such. That’s the shorthand version of the argument. There are other criteria that establish the divine character of the Bible, but I will not have time this busy day to outline them right now. If you are interested, the pertinent materials are readily available. I would start with works such as F. F. Bruce’s “The New Testament Documents: Are They Reliable” as it is short, succinct, and elegant in its demonstration of the answer (which is “yes”). The bible and other religious texts make supernatural claims. The bottom line is that supernatural claims are a dime a dozen in the world now and especially in the past. They are “true” only to those that have faith in them. There is no universality and no established norm in supernaturalism, only faith. Those supernatural claims are subject to verification and authentication. Christianity is an historical religion–it states that these things actually happened in specific places to and with specific persons at specific times. There are records; there are witnesses. As Paul told Festus and Agrippa, these things were not done in a corner. Perhaps it would help the conversation if you define what you mean by “faith.” This is something that trips people up all the time. Honestly Ken, I’m interested in religion in general and how and why people embrace these unverifiable supernatural beliefs. But not Christianity in particular. Sadly, then, you have chosen to impoverish yourself by turning your back on the inestimable beauty of Jesus Christ. Knowledge puffs up, sir; I urge you to pursue and gain wisdom. Ken, I urge you to pursue and gain wisdom too. Try studying the history of the universe and the evolution of life on the Earth. Read some modern philosophy such as Daniel Dennett, “Breaking the Spell” where he analyses why people embrace various supernatural belief systems. In a natural universe, what is the explanation for religion? In the pursuit of wisdom, there is a starting place. The fear of the Lord God is the beginning of wisdom, and the knowledge of the Holy One is insight. Lacking these, one gets off on the wrong path. It is like the man who dropped his car keys in the shadows but looks for them only under the lamppost, or the woman who intends travel to New York but boards a plane to Los Angeles. If you presuppose a solely “natural” universe, as you aver, you have cut yourself off from the truth by ruling it out of bounds in the first place. Threats? I see no threats. And you have it backwards. The Master and Creator of the universe has revealed himself graciously; I am just an unprofitable servant. By fear, Kenneth is referring to a Holy Fear that acknowledges of actuality of God in reference to his own potentiality. From our anthem “T’was Grace that taught our heart to fear, and Grace my fear’s relieved. As you may be aware the most common command in Revealed Law is to fear not, be not afraid to those who know, respect and love God. To those that reject Him in thought, word and deed, He respects that individual decision to spend eternity outside of His Presence. Here’s another version of what I posted above; this is from R. C. Sproul. “There’s a difference between objective proof and the persuasion or conviction that follows. John Calvin argued that the Bible carries both persuasion and conviction in terms of its internal testimony—the marks of truth that could be found just by an examination of the book itself—as well as external evidences that would corroborate that substantial evidence to give solid proof for its being the Word of God. “Yet the last thing people would want is a book telling them they are in desperate need of repentance and of a changed life and of bowing in humility before Christ. We don’t want that book to be the truth. Calvin claimed that there is a tremendous bias and prejudice built into the human heart that only the influence of God the Holy Spirit can overcome. Calvin distinguished between what he called the indicia—those objective evidences for the trustworthiness of Scripture—and what he called the internal testimony of the Holy Spirit, which is necessary to cause us to surrender to the evidence and acknowledge that it is the Word of God. “But I think this is a critical issue upon which so much of the Christian faith depends. The Bible makes the claim that it is the unvarnished Word of God, that it is the truth of God, that it comes from him. God is its ultimate author and source, though indeed he used human authors to communicate that message. In speaking with people about this, we have to go through the laborious process of showing first of all that the Bible as a collection of historical documents is basically reliable. The same tests that we would apply to Herodotus or Suetonius or any other ancient historian would have to be applied to the biblical records. The Christian should not be afraid to apply those kinds of historical standards of credibility to the Scriptures, because they have withstood a tremendous amount of criticism from that standpoint, and their credibility remains intact. On the basis of that, we come to an idea. If the book is basically reliable, it doesn’t have to be inerrent or infallible; it gives us a basically reliable portrait of Jesus of Nazareth and what he taught. Does the existence of the Mormon Church prove that the angel Moroni is an historical fact? Alleged miracles can’t be used as evidence for another alleged miracle. There are Islamic and Buddhist martyrs. Did 9/11 pass you by? The Church is full of Miracles and Martyrs. People do not go to their deaths for no reason. Martyrs refuse to deny their Faith even when those like you think killing us will make us weak like you. The buddhists and mohammedans both being literal devil worshippers (one worshipping hell, the other worshipping a crescent-horned “morningstar”) commit suicide as their dark master commands of them. As for the miracles of the Church, they are numerous and easy to look up. That you actively deny them means you know they are there. As for mormonism, what does 18th century freemasonry have to do worth miracles? It all comes down to naturalism vs. supernaturalism. Science will be rediscovered because it works, because it describes reality. Supernaturalistic beliefs like Christianity or other such religions have no direct evidence in the physical world so their recreation is unlikely. Although religions like Christianity could get rediscovered because they are great memes! Believe me and you will live for ever, believe me and all your past bad behavior can be forgiven, and make sure you spread me to everyone you know. Successful memes are made of such ideas. So religions that contain these memes are likely to be recreated, but not because they are true, but because they are good memes. Science is merely the study and appreciation of the Created Order that are governed by three families of laws, Natural Law, the Metaphysical Laws (reason, logic & mathematics, etc) and Revealed Laws (to which you take vehement exception and reject). Each of us are given three gifts reason, free will and human agency to facilitate choice the most fundamental of which is to accept or reject God for which there are consequences in the materialistic here and now as well as the metaphysical then and forever. We are provided with a metaphysical conscious by which we may be guided to a Greater Good. The cornerstone of your naturalistic (atheistic) world view is the rejection of the First Cause and Final Cause in favor of your self-limiting material and efficiency causes. Edward Feser in his books “Last Superstition” and “5-Proofs for the Existence of God” may enlighten you as well as expose the fact that you may not appreciate nor like the logic but cannot rationally refute the logic of the Creator though you may have a personal opinion to the contrary. The best that the current moderate realist of the Scholastic can do is to encourage you to make better choices in the here and now with our sincere encouragement to better understand your choices, your decisions in your own best self interests. 1) When the humans on the planet can present any universal way to determine which of the hundreds of thousands of revealed laws are the true ones, I would certainly reconsider my objections. For this class of law, it currently comes down to various twists on “I believe my laws to be true and the others to be false.” I live in an area with many LDS people, they sincerely believe that they have living prophets to provide updates on these laws. Are these true or false? Can you come up with anything that is independent of your specific beliefs as your argument? 2) You assume that this Creator and Master of the Universe is the specific Christian god that you believe in. The universe may have a creator, but the thousands of embellishments to this generic creator are justified by your relieved “truth” not by the creation itself. Again, can you come up with any justification for the Christian embellishments that is independent of your faith in the Bible? It is not what I propose but the reason and logic of the moderate realism of the Scholastics. Again within the confines of this space I can only direct you to the introductions to moderate realism by Edward Feser (one among several) as noted above as your embrace of relativism (where all fluid and subjectively true and false depending on populist sentiment) with the wholesale rejection of Objective Truth of moderate realism). The moderate realism of the Scholastics is the universal means to differentiate objectively between right and wrong in accordance with Natural & Metaphysical Laws) that may be and can be further refined and substantiated by Reveal Law. We are provided the option to approach God in faith and faith alone by Revealed Law or to approach God in accordance with Natural & Metaphysical Laws by those that seek an Objective Truth. The keystone issue with the naturalism’s world view is simply that your opinion is worth no more, no less than another other option irrespective if it is substantiated or not if it has any value to anyone including yourself at all so your are abusing your metaphysical and natural gifts for little else than make noise given your strategic approach to reduce everything to fluid subjective truthiness at the moment. Are we preoccupied by those questions? Most people have more pressing matters to worry about. Are you quite sure that science hasn’t addressed ANY of those questions, as you claim? The theory that morality has evolved to allow us to cooperate and live in groups is quite well established. Similarly, are you quite sure that these are unique to humanity? Other animals species that live in groups exhibit behaviour which we can interpret as moral behaviour. In any case, science isn’t designed to answer ‘why’ questions, but so what? The ‘answer’ God-did-it isn’t an answer anyway as it doesn’t explain or predict anthing, nor does it demonstrate that a god exists, for that matter. I didn’t say “therefore a creator god does not exist”, so don’t put words into my mouth. — From the Overture, “LOGOS: The Mystery of How We Make Sense of the World,” (2018), the UK’s own prodigiously published, and widely recognized Polymath/Humanist [i.e., ‘Humanists UK’], Dr. Raymond Tallis, retired clinical neuroscientist & medical physician, turned philosopher. And Dr. Tallis has demonstrated for so many years now, an uncompromising intellectual integrity, or profoundly distinctive objectivity, in this war of worldviews through his published works. As an aside: Isn’t it illuminating to watch so many of those scientistic devotees of an a priori “high-octane naturalism” – of whom were responsible for giving the thumbs-down-vote against these two magisterial works of cutting-edge “science” itself in 2011 & 2012 respectively – whose IMPLICATIONS nonetheless, seemed to have powerfully ruffled-the-ideological-feathers of those otherwise scientifically minded individuals, “controlling the cultural microphone” throughout the West??? Hmmm…. Because it’s manifestly certain that the biblically revealed “rational/intelligibility” of the universe (in elegant mathematical precision at that), of which was unambiguously declared in both Old & New Covenants – i.e., can you say a self-existent, transcendent, non-physical/personal “causal” MIND, being logically prior to its materialistic effect(s) in nature – will never be resolved or answered, through a philosophically “mindless,” thus “unintelligent” approach to the scientific inquiry of supposed dead, inanimate mass/energy, “in chaotic billiard ball motion,” aka Methodological Naturalism and/or “Methodological Atheism.” Talk about tail-chasing nonsense! There IS a Creator God, of whom has personally revealed himself to his specially-created spirit creatures Homo sapiens – in the person of Yeshua-Jesus of Nazareth….and we ain’t Him! Have a great day & weekend my friend! They are forgetting one simple thing. Religion came first. So if we lost all memory of everything most likely we would become religious. Even early man knew that because there is something rather than nothing that there had to be a creator. It wasn’t until more recent history that people disconnected from logic and said the universe could have created itself.